It is time!! Your Mission Team is being called to send a delegation from Lake City United Methodist Church to Bolivia to help Bryan and Molly at New Hope Tutoring Center. We are just starting to work on this project. There will be more information coming soon. The Mission focuses are two fundraisers: " Blocks for Bolivia" and a Garage Sale May 5-7. Kandy has crochet and knit lots of 4" blocks for Bolivia. You can purchase blocks for $5 each and put them on the sheet that is hanging in Rogers Hall. When blocks are all purchased and the sheet is full, we will sew the blocks together and then sell the yarn quilt/afghan at an auction this summer. The Garage Sale will be during the 100 Mile garage sale. You can help with this project by donating things that you now longer want or need to this effort. You can help during the garage sale and always pray that our Heavenly Father will guide us in the way he wants us to go. The funds raised will support our folks going to Bolivia. The Canny’s developed the after school program, New Hope Tutoring Center, to the point where all the other churches in their district will replicate their model to provide outreach to disadvantaged families. Bryan and Molly Canny are career missionaries with Evangelical Church Missions serving in Bolivia. Molly has three years of experience in Bolivia working in children’s ministry and teaching at the Santa Cruz Christian Learning Center. Bryan and Molly were married in May of 2010 and are excited about how God will use them to serve Him. Bryan visited Bolivia in the Spring of 2010 and has a call to join Molly in the ministry there. 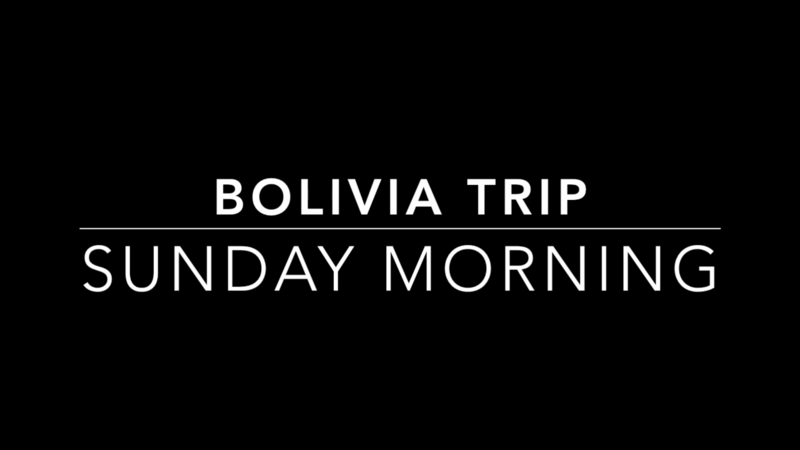 If you would like to give to support this mission, please make your check out to Lake City United Methodist Church and put "Bolivia Mission" on the Memo line. More info on Giving. If you would like to help with this mission, click here. 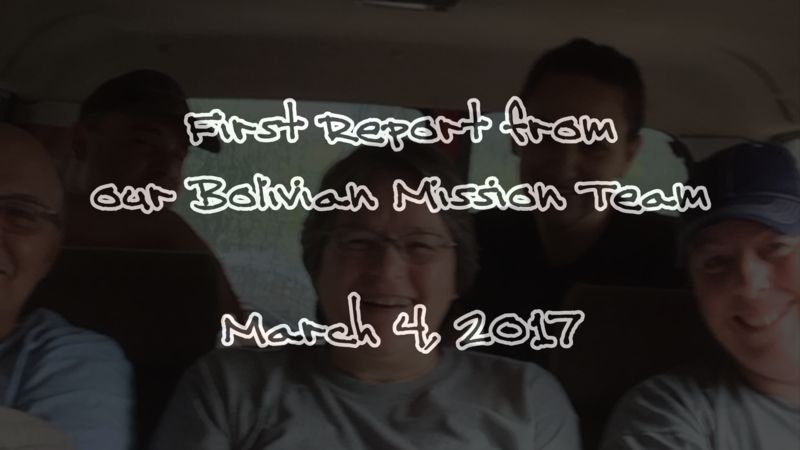 The mission team has arrived safely in Bolivia and sent us some photos taken in the first few days because they couldn't upload a video. Here is a short video made from those pictures. And here is the video that they were going to send that first Sunday (March 5). The Team has left for Bolivia. Pray for their success in the mission and a safe return. Your Bolivia Missions team talked to Molly and Brian Canny on Facetime on January 10. We leave February 28 and return March 12. We will be doing finishing work at the new tutor school as well as registration of students. Bolivia mission dollars will be used for extra luggage, vaccination expenses, and Canny’s Mission funds. Please bring your baskets to church soon. We would like the non-perishable baskets the first week of August, and the perishable baskets can come on the August 10. There will be food – have dinner with us. There will be games – come and play or just listen to the music. Enjoy the live auction by Greg Sprick or bid on the basket at the silent auction. Bid on the Blocks for Bolivia Quit. We’ll have something for everyone in your family to do. Tell everyone about what is happening at Lake City United Methodist Church. If you would like to create a Make it – Bake it – Grow it - Baskets for the Auction on a Mission, baskets are available here or you can use one you already have. Your creation can be brought to church starting July 27. Auction on a Mission Family Fun for Night is August 10 5:00 - 8:00 Fundraiser for your Mission Team going to Bolivia. Your Mission Team going to Bolivia Damon Lichtblau, Kandy Olson, Randy Olson, Pastor Phil Schmidt and Mallory Westphal. YOUR Mission team thanks you for all of your support making the 4660 mile garage sale - fundraiser for Bolivia mission trip an outstanding success. Your Mission Team is being called to send a delegation from Lake City United Methodist Church to Bolivia to help Bryan and Molly at New Hope Tutoring Center. The Bolivia Mission trip application is available in the foyer. The Mission focuses are two fundraisers: " Blocks for Bolivia" and a Garage Sale and Bake Sale May 20 &21. Kandy has crochet and knit lots of 4" blocks for Bolivia. You can purchase blocks for $5 each and put them on the sheet that is hanging in Rogers Hall. When blocks are all purchased and the sheet is full, we will sew the blocks together and then sell the yarn quilt/afghan at an auction this summer, we are just about half way there. The Garage Sale and Bake Sale will be held May 20 &21. You can help with this project by donating things that you no longer want or need to this effort. You can help during the garage sale and always pray that our Heavenly Father will guide us in the way he wants us to go. The funds raised will support our mission team going to Bolivia in February 2017.